A Review of No Thanks! 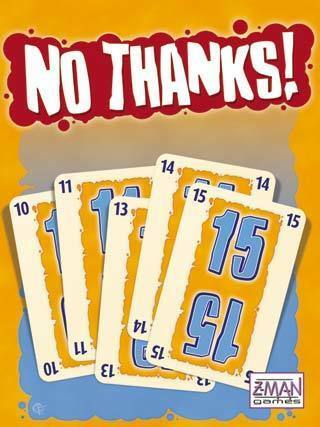 So How Do You Play No Thanks!? So How Do I Like No Thanks! This is a very fun and surprising game. The rules are so simple yet the strategy involved with keeping your point total low, trying to get sequences, and keeping some chips makes for hard decisions. I like this. The fact that you do not use all the cards ensures that you can’t card count as you never know which cards are in the deck and which are in the box out of play. This is a good mechanic. There is a take that element in the game that is fun. You can drive play around to the guy who has no chips left, forcing him to take the card in play. You can take a card to keep it from someone need it for a sequence. 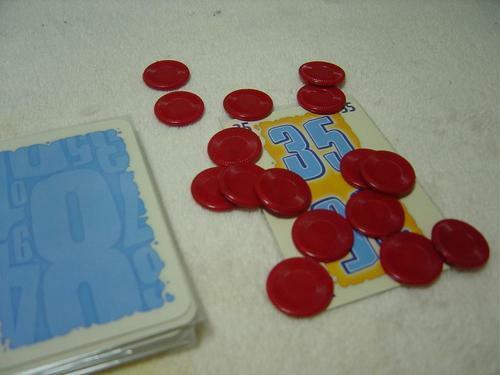 You can take a card just to keep the next players from getting needed chips. All of these tactics come into play to add fun. My group was very surprised by this quick filler. It has unseen strategy and tons of fun. It is a regular filler at Hypermind and one I will be teaching at work soon. No Thanks! probably the best game to introduce to new/non-gamers. I’ve never had anyone not like this game. It’s a game that should be in every collection.